Many people spend lot of time browsing on their laptops and don’t really use other features of a full blown Laptop and they end up spending lot of money buying these laptops. Google introduced a lightweight Chromebook for those who spend large amount of time browsing on the internet. Google’s Chrome OS is based on Linux and is designed to work purely with web services. All you need is an internet connection to take advantage of its power. Chromebooks have many advantages some of them include. There are tons of Apps which are available on the Chrome Store which are available for free. Some of the most used apps like Search, Gmail, Youtube and Hangouts are mostly pre installed and all you have to do is click them to start using. 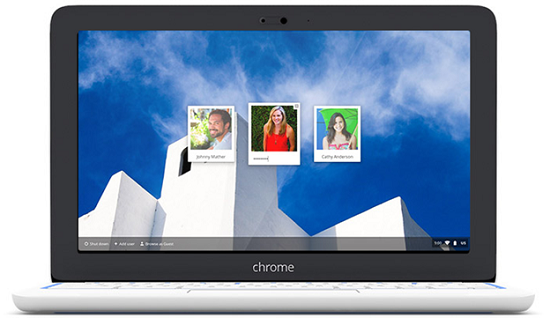 Chromebooks also support multiple user login so multiple people can use the same Chromebook. All Bookmarks, Wallpapers are unique for each user. Many times people avoid shutting down their bulky laptops because of the time it takes to boot the device. Chromebook boots in around 10 seconds. Yes you heard it right, 10 seconds is all it takes to boot this device. Its OS the Chrome OS is so light weight that the booting is instantaneous and the main reason for this lightning speed is that the Chrome OS runs very limited processes at the time of booting. Some of the Chromebooks start with as low as £229. At such a low price you get a device which has amazing browsing capabilities and which is very close to a Laptop. You get around 100 GB of free Google drive cloud storage for up to 2 years so you don’t need to worry about taking backup of your device data. You can lose your Chromebook but not your data. Isn’t that amazing? All your data is protected through redundant storage at multiple physical locations. OAuth and granular access controls form strong, configurable security. Chrome OS is based on Linux as a result viruses have no impact on Chromebook. All your data is always secured. The Chrome OS is automatically updated whenever you login so you don’t need to worry about software updates anytime and you can simply focus on your browsing experience. Apps in the Chromebook run in a sandbox mode and this prevents them from harming the OS system files. If you are a casual computer user and you primarily do internet Browsing on your Laptop buying the Chromebook can be a very smart decision for you. If you are confused between a Tablet and Chromebook then this point will clear your doubt “If you are interested in a Desktop like browser experience with full flash capabilities and multi window support then Chromebook is a better bet for you” So what are you waiting for order your own Chromebook today from Argos.